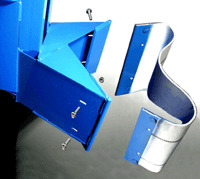 MORSpeed models will handle rimmed steel, fiber and plastic drums. 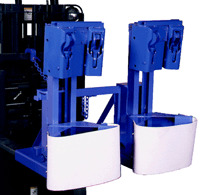 They require a minimum drum height of 24", but will handle any diameter. 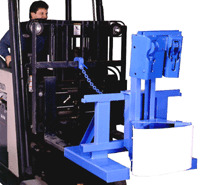 They will work with or without pallets, and even with damaged or straight walled drums. 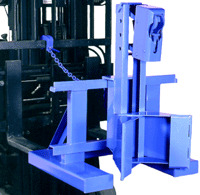 The minimum weight required is 75 lbs. per drum on a model with (1) head per drum and 350 lbs. with (2) heads per drum. 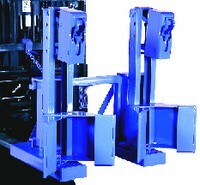 Jaws: Wide MORSpeed jaws are contoured to securely grasp virtually any rimmed drum. 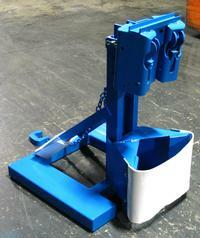 The encased mechanism provides precise, reliable, automatic drum gripping. Model MO-2523-P - Belt Kit puts a fabric surface in from of the steel backrest of the MORSpeed to protect the finish on a drum. Requires (1) belt per drum. Spark resistant models are also avalable - Please call ZORIN (888) 378-6525 for a quote.